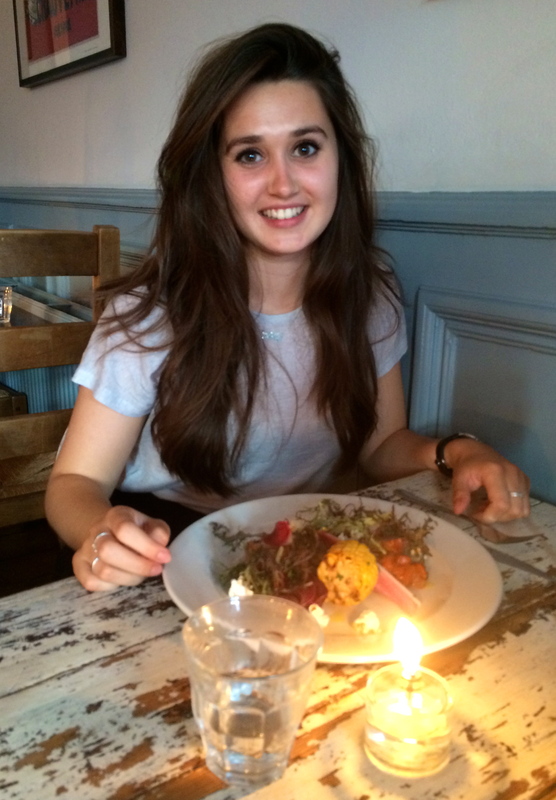 Claude’s Kitchen in Parsons Green has long been a favourite restaurant of mine. 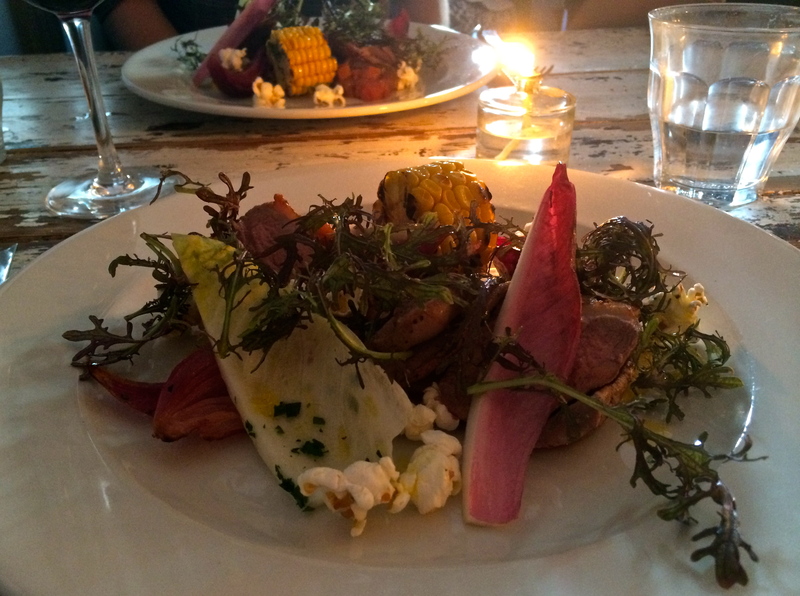 Not long after I moved to London, my housemates and I quickly discovered an extremely jammy deal that Claude’s have going on a Monday and Tuesday evening- 2 courses for £16 or 3 courses for £20. What a bargain! We couldn’t resist, and it has been our local haunt ever since. 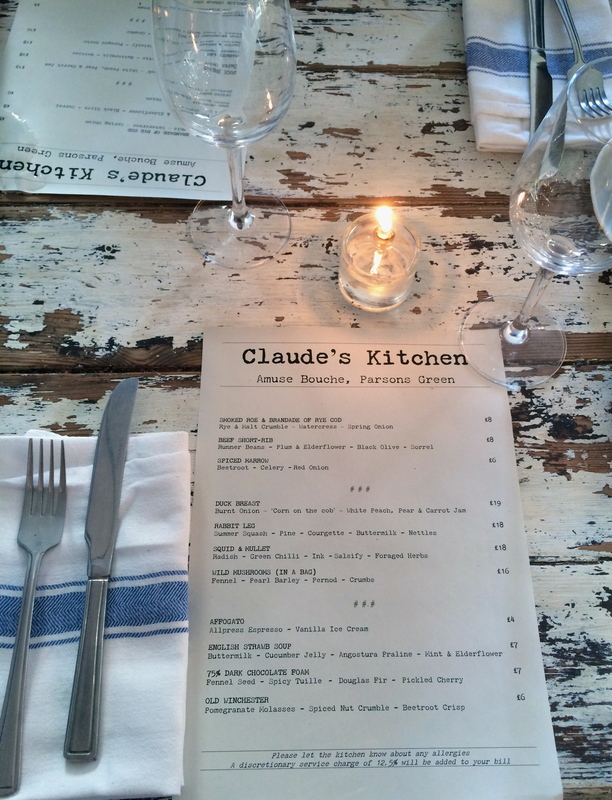 But upstairs in Claude’s Kitchen is where the magic happens! Even the bread and butter is beyond delicious… freshly baked bread with rich salted butter. Before we arrived, my housemate even declared how excited she was for the bread alone! It’s that good. 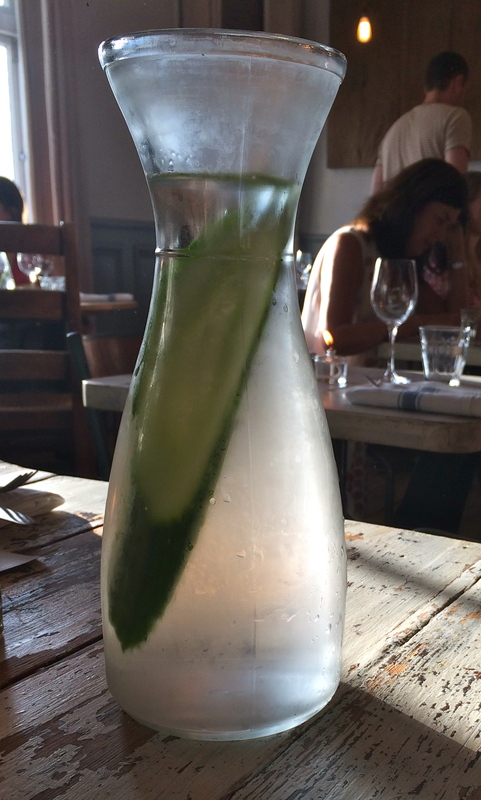 Fresh cucumber water is plonked on your table. I would have been quite content with the bread and water alone! The atmosphere inside is cosy and inviting. Candles are on every table, and low lights dangle from the ceiling. Anyway… down to the menu! We all kicked off with the beef short rib to start. 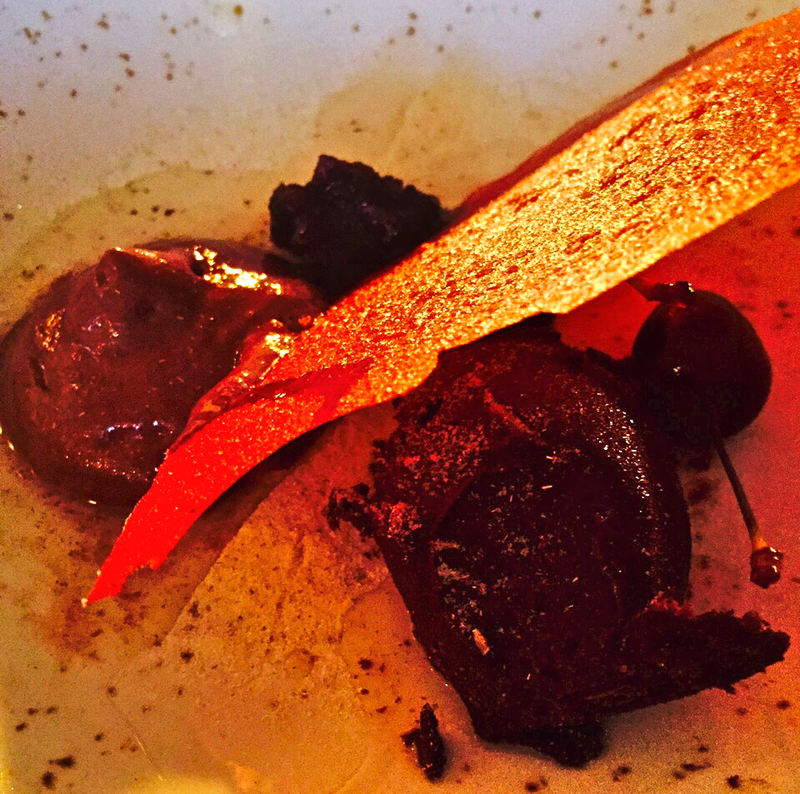 It was incredible melt in the mouth beef, plum and elderflower puree with black olive and sorrel. It literally fell off the bone! The waitress told us it had been slow cooked for 4 hours, and oh boy could you tell. 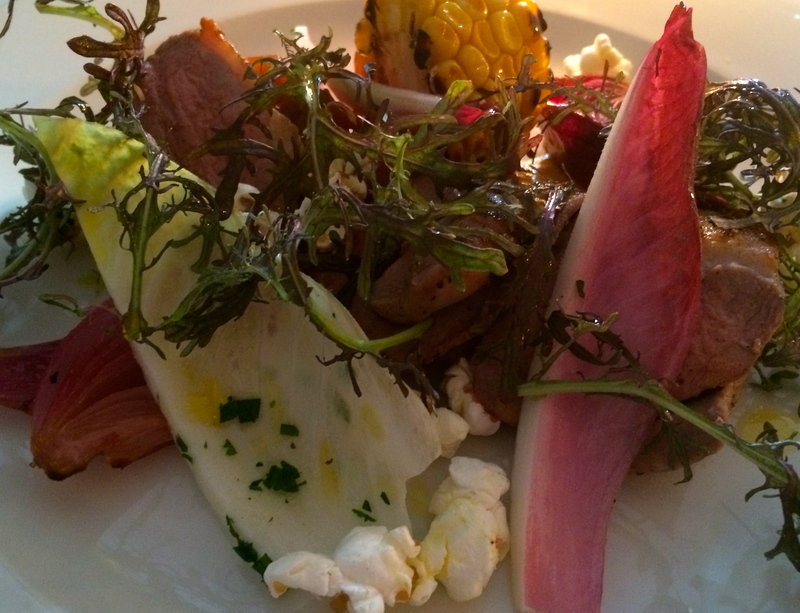 After much deliberation, for main course I eventually decided upon the duck breast. 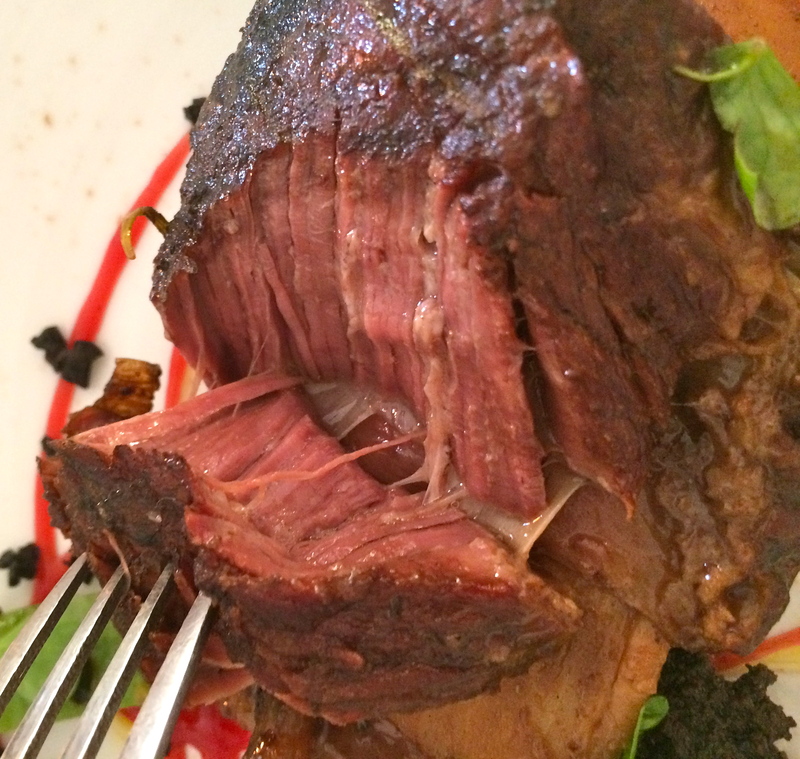 It was the most beautifully cooked duck I’ve ever tasted. Accompanied by burnt onion, corn on the cob and served with a white peach, pear and carrot jam, the whole plate was just heavenly. It even had a bit of popcorn thrown in there! It almost felt too pretty to eat. Edwina went for the squid and mullet with radish, green chilli, foraged herbs and squid ink. Another plate of food that looked too good to eat. 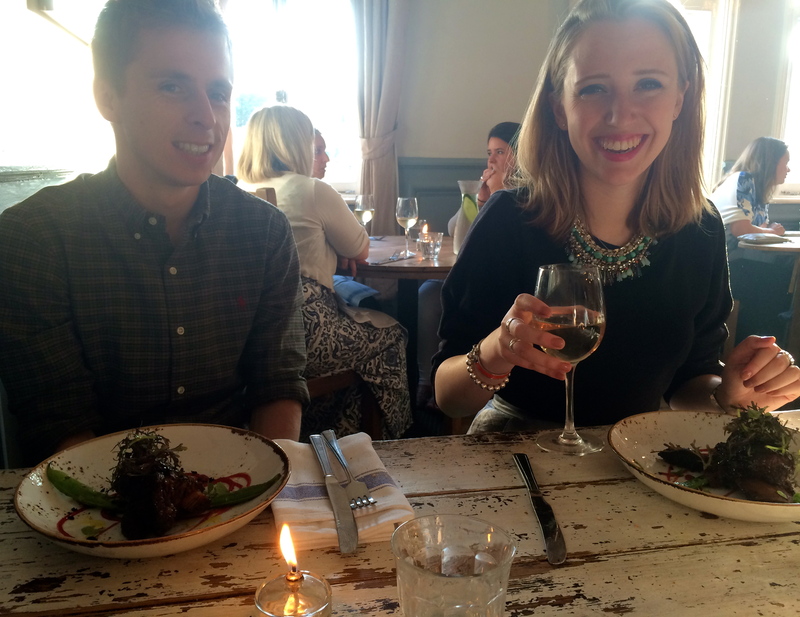 It was 2 courses for £16 so we could have just stopped there…. but that would have shown some kind of restraint and ability to say ‘no’ to dessert. I possess neither of these traits. I blame the low lighting… it lulled us into it. Feeling summery, I went for the ‘Strawb Soup’. It was a beautifully light blend of seasonal flavours- cucumber jelly, buttermilk, praline, mint and elderflower. Paul and Edwina both went for the chocolatey option- 75% dark chocolate foam, douglas fir, pickled cherry and topped with a spicy tuille. I rather think I won the dessert contest! It was, as always, another beautifully executed three course meal. 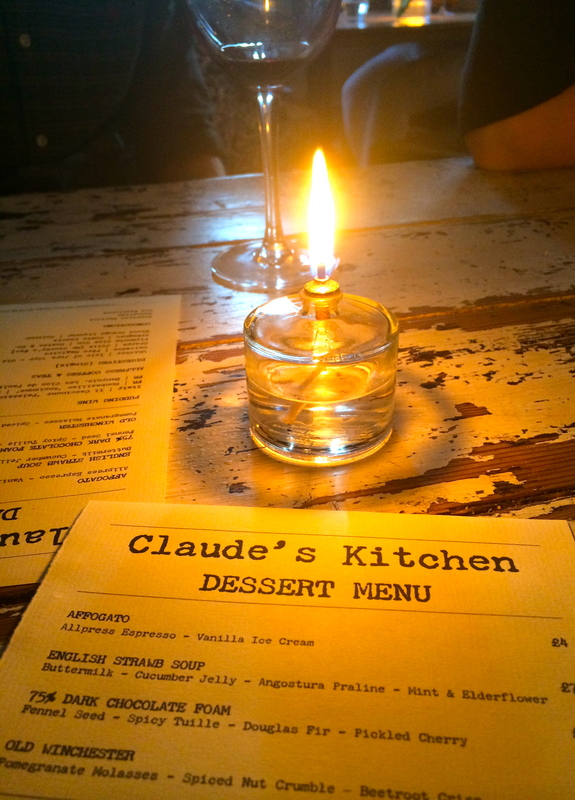 Claude’s Kitchen is right at the top of my list of favourite London restaurants, and that really is saying something! Go on a Monday or Tuesday if you fancy a mid-week bargain, or equally of a weekend if you fancy a splash out meal- I promise it will be worth every penny. If you’re after something a little less fancy, I would highly recommend The Tommy Tucker– head chef Claude’s reasonably new pub in Fulham. 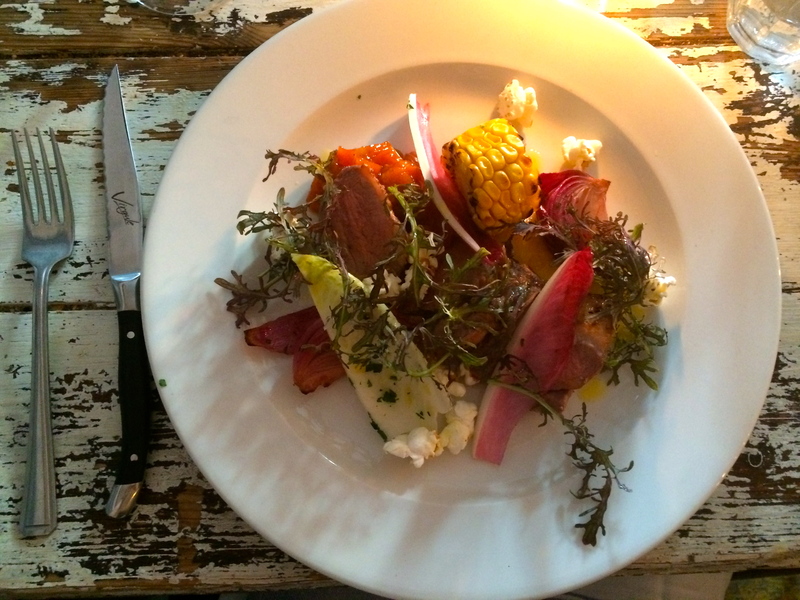 Expect the same standard of excellent food but with a slightly more rustic feel.